By Ngoc Luu, D.O., Timothy McKnight, D.O. A 54-year-old man presented with diffuse abdominal pain and sepsis. A longitudinal sonographic image of the gallbladder (A) demonstrates gallbladder wall thickening with edema, pericholecystic fluid, gallbladder distention, and layering sludge with gallstones. Axial noncontrast CT image (B) shows marked pericholecystic inflammatory changes. CT can evaluate for such complications of acute cholecystitis and may also assist in evaluation of other etiologies of gallbladder wall thickening if the clinical presentation is nebulous. Nuclear medicine cholescintigraphy is helpful in distinguishing acute from chronic cholecystitis. Endoscopic retrograde cholangiopancreatography (ERCP) or magnetic resonance cholangiopancreatography (MRCP) may detect choledocholithiasis. 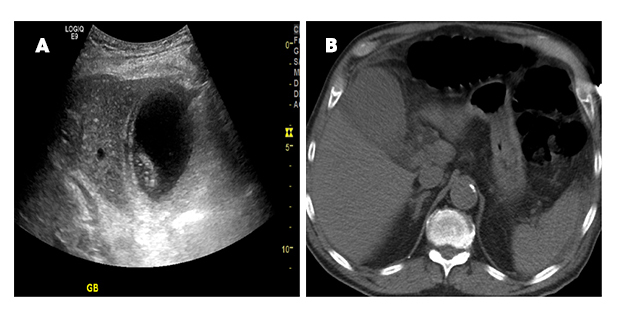 Patients with acute cholecystitis are treated with cholecystectomy, or percutaneous transhepatic cholecystostomy tube in poor surgical candidates. O'Connor OJ, Maher MM. Imaging of cholecystitis. Am J Roentgenol 2011;196: W367-W374. Luu N, McKnight T. At the Viewbox: Acute Cholecystitis. J Am Osteopath Coll Radiol. 2016;5(2):30.